Wondering if it will include a log profile....? Seems like a necessary addition with the latest generation of cameras. Fujirumors reports it will :) Also, cropless IBIS and new Eterna film simulation. Should a hell of a camera. I have great hopes for this rumor it might be just the thing to convert me from Panasonic. Looking forward on how this rumor plays out. Decent IBIS, 4K 60fps and it might be my next camera. Specs info updated from different sources. We expecting 10bit color internally ? Why should this (rumored) camera be appealing to video shooters? @theconformist For some of us that want a hybrid camera very capable of both stills and video it is interesting. APSc pdaf sensor (less noise,better focus). Focus in video and stills looks reasonably good. Video currently looks good on existing models and it has some nice baked in film looks requiring less editing potentially. I personally like the manual dials old school. Excellent primes that due to the APSc sensor don't suffer as much in the equivalence debate, so you can save money and weight not chasing super fast glass. Although it now looks like 4K will be 30fps max not 60fps and the 1.17 crop of the APSc sensor stays so that now lowers my interest a little. Some one dedicated to video probably would be better served by Panasonic. That being said if your a true hybrid shooter that does not want to invest in several bodies it may be worth looking at. It depends on just how good the rumored offerings really are and what is most important to the individual buyer. Great purchased a XT20 over Christmas to try FujiFilm out and really like it. Hoping the X-H1 will be amazing and my next camera. 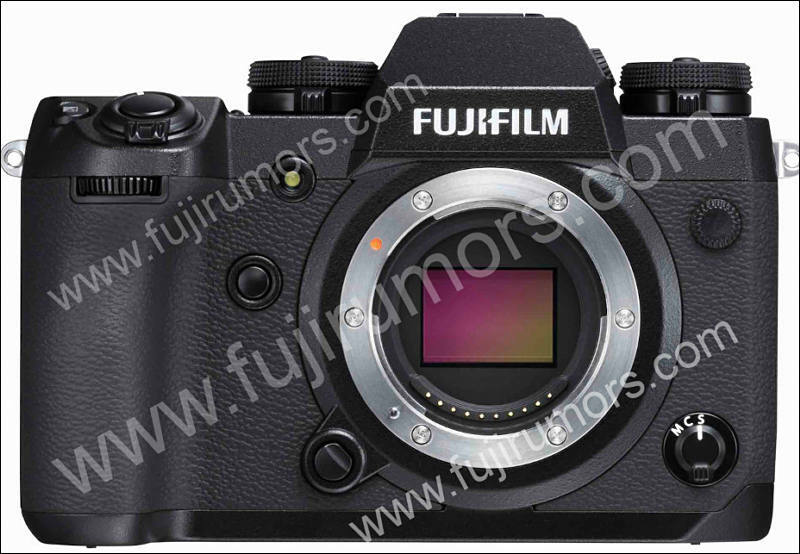 FujiFilm XH1 now rumored to have IBIS and OIS working together. I'm enjoying my XT-20 and really looking forward to the XH1. If camera makers would simply adopt a few of the Panasonic features they would sell a ton of cameras. Dumb as rocks. @DrDave I think that is what is slowly happening. Just like it appears the adjustable view finder on the Panasonic G9 was inspired by the FujiFilm XT-2. I use to ignore FujiFilm but they have come a long way in a little time. Now that there sights are on video I think they are a brand to watch and I've bought in. Why so slow with announcement? Got two Fujifilm lenses, want to try them on this camera. Camera really looks like photo oriented. @Vitaly_Kiselev Well that is there background but that being said this is there video centric camera. 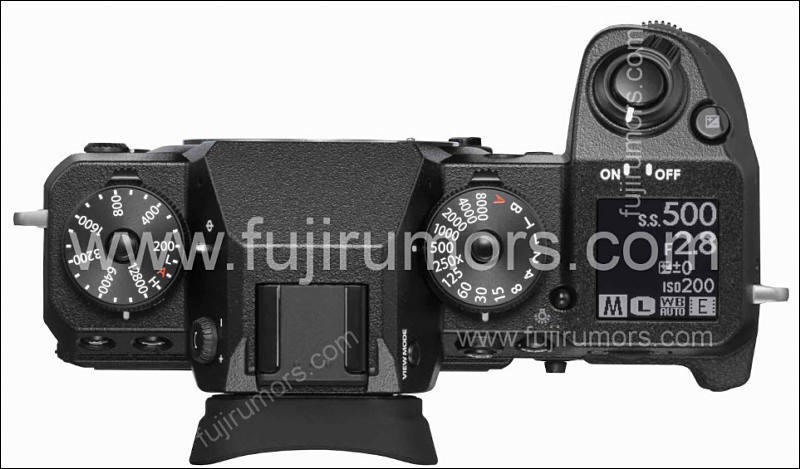 The XT-3 is do out in September should be interesting how they differentiate models going forward. I mean, video-centric would for sure mean the camera does not stop in the middle of the video after 5 minutes or ten minutes or whatever. Hopefully that will be the case. Kleve, February 15, 2018. Professional image quality, rugged housing and advanced video functionality – FUJIFILM X-H1 extends FUJIFILM’s multi-award winning X series with most powerful model to date. It offers a number of features specific to the particular needs of professional photographers and videographers. The X-H1 has a newly developed, extremely robust housing and has as first model of the X series an integrated 5-axis image stabilization (IBIS), which in Combination with FUJINON XF lenses up to 5.5 levels * 1 longer exposure time times allowed. It also has a flicker reduction mode, the Reliable metering results even in difficult lighting conditions guarantees and, for example, the quality of indoor sports photography significantly improved. The camera fits perfectly with the new professional FUJINON Cine lenses MKX 18-55mm T2.9 and MKX 50-135mm T2.9 for the X bayonet, both for May 2018 are announced. In addition, it is of course compatible with all stationary lenses of the XF and XC series, which will be available by the end of the year the high-speed telephoto lens XF200mmF2 R LM OIS WR and the ultra-wide-angle Zoom lens XF8-16mmF 2.8 R WR is extended. 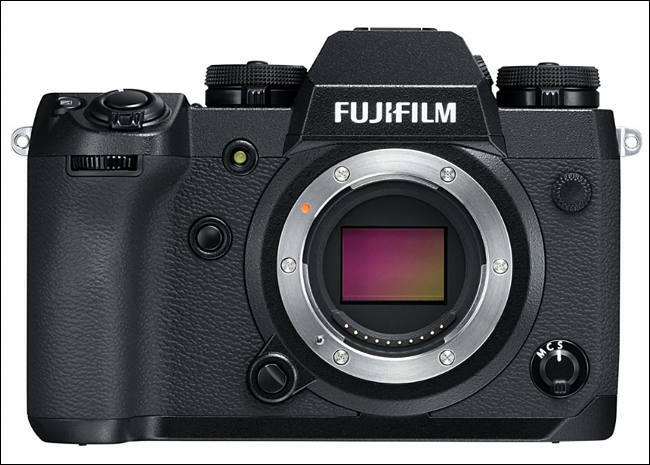 The FUJIFILM X-H1 will be available at March 2018. The internal image stabilization system (IBIS), the first time in a camera of the X series is used, has three axial acceleration sensors, three axial gyro sensors and a very powerful dual-processor based the measured data performs about 10,000 calculations per second. In Combination with the effective compensation mechanism will be a special Precise image stabilization and thus achieved an uncompromising image quality. 5-axis image stabilization is possible with all XF and XC lenses. there is synonymous with lenses without their own optical image stabilization stabilization of up to 5.5 EV levels * 1 possible. With the already available XF lenses will be Stabilization of more than 5 EV levels achieved with a few exceptions * 2 . This performance is made possible by state-of-the-art technology. So the individual components of the Image stabilization unit positioned by means of a laser measurement, whereby a twice as high degree of precision as conventional Manufacturing processes. As part of the inspection and adjustment of each one Camera will ensure that the sensor as with X series models without integrated image stabilization is aligned absolutely parallel to the image plane. The shutter is based on a spring mechanism, the finest vibrations in the Interior of the housing minimized. With the electronic first shutter curtain and the completely electronic shutter make vibration effects practical completely exclude. The X-H1 has a 24.3 megapixel X-Trans CMOS III sensor without low pass filter and a powerful X-Pro processor. The same combination already comes in the internationally award-winning professional X series Models X-Pro2 and X-T2 are used. In conjunction with the high quality FUJINON lenses and FUJIFILM’s over 80 years of experience in color reproduction, outstanding images can be produced with the X-H1. Even finest details of the texture of objects become with high plastic appearance reproduced, which makes the unique atmosphere of a scene special Way is recorded. The case of the X-H1 is made of a sturdy magnesium alloy, which is around 25 Percent thicker than the X-T2. Although the camera thus much more robust and more stable, the housing falls due to a new attachment of the bayonet ring. velvet compact and lightweight. The X-H1 is dust and splash proof and also Fully functional in cold temperatures down to minus 10 degrees Celsius. The outer one Due to larger particles, the coating has a surface hardness of 8H and is therefore particularly resistant to scratches. 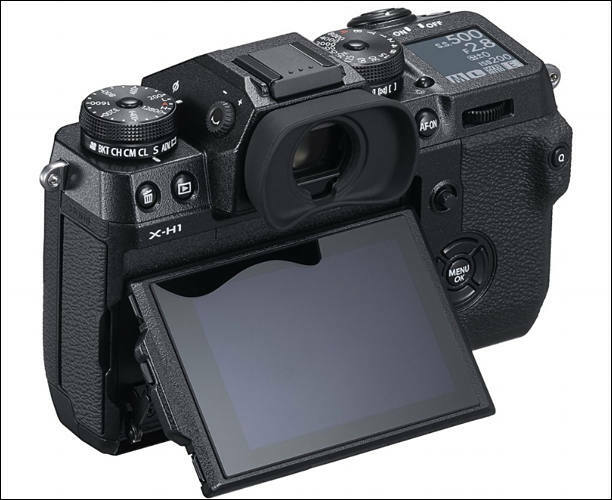 Viewfinder and LCD The electronic viewfinder with a resolution of 3.69 million pixels and 0.75x magnification provides leading performance in the segment of mirrorless system cameras. Due to the ultra-short response time of only 0.005 seconds and a fast frame rate of 100 frames per second Movements in the viewfinder image are extremely smooth. Even With dynamic subjects, the photographer can capture the image very precisely. tune and compose the picture exactly according to his ideas. The 7.6 cm (3-inch) touch-screen LCD on the back is in three Fold and swivel directions. It has 1.04 million pixels. As already with the mirrorless medium format camera GFX 50S are the most important Recording parameters also on the X-H1 in addition to a 3.25 cm (1.28 inches) large shoulder display easy to read at any time. At the suggestion of professional photographers, the operating concept of the X-H1 in the Optimized compared to other models of the X series at a total of 19 points. So For example, due to the larger grip, the camera is even better in the Hand. The X-H1 triggers extremely quiet, making it ideal for situations where absolute Rest is necessary, such as the reception of wild animals, or at weddings. In addition, the buttons on the back of the camera have been enlarged and the Grip of the dials improved. On the back there is a new AF-ON Key that activates the autofocus with the thumb released from the trigger can. The focus lever makes the focus point very comfortable and easy to use move quickly to the desired position. The X-H1 is the ideal tool for multimedia productions that are present in many today Areas are required by default. Your video feature has a total of 20 functional and performance improvements, making it ideal for the professional Film records. As the first camera of the X series, it offers the ETERNA film simulation, its subtle Color rendering and detailed depths the user in post-processing many creative freedom opens up. Videos can be used for optimum picture quality to record at a high bitrate of 200 Mbps. The camera also offers Cinema 4K recording in 17: 9 format, DCI 4K Recording 4,096 x 2,160, the Full HD recording with 120 frames per second (fps) for slow-motion (2x, 4x, 5x), the F-log * 4 and timecode recording as well as the 4K F-Log recording directly to SD card, a 400% dynamic range (about 12 F-stops) and an integrated microphone with high sound quality (24-bit / 48 kHz). Flicker reduce mode for video The imperceptible flicker of the human eye, for example in a sports hall, can be the result of exposure metering distort. To avoid this effect, the X-H1 has a flicker reducer mode that ensures reliable exposure even in difficult lighting conditions. guaranteed results. The autofocus of the X-H1 has an improved algorithm that the Accuracy and speed of focus in low light situations clearly improved. Thus, the sensitivity of phase detection AF has been reversed 1.5 f-stops increased from 0.5 LW to -1.0 LW, so this is now synonymous with lenses with open aperture to use F11, such as the XF100-400mmF4.5-5.6 R LM OIS WR with teleconverter XF2X TC WR. Also motifs with finely detailed surface structures (eg plumage or fur), the can not yet be detected optimally by the phase detection AF, can be now focus quickly and accurately. In addition, the performance of continuous autofocus (AF-C) was at Zooming greatly improved, which is advantageous in situations such as in the the main subject moves unpredictably (eg sports footage). 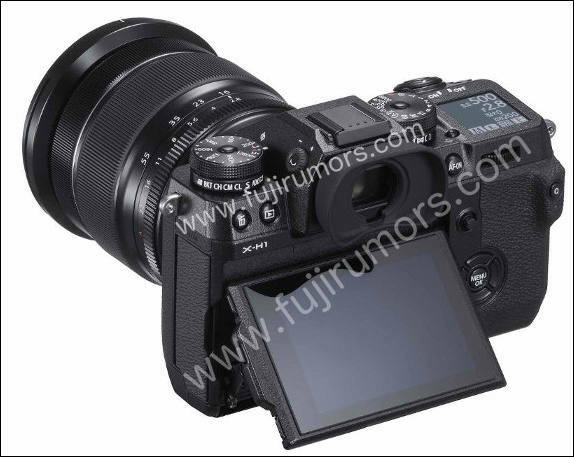 The exclusive battery handle for the FUJIFILM X-H1 allows the Maximize camera performance. He lets himself, in addition to the battery in the camera, Equip with two more batteries, so that up to 900 shots are possible. In boost mode, the burst speed, the frame rate and the Reaction time of the camera accelerates as well as the minimum blackout time further shortened. 4K filming with a battery grip increases the maximum close to 30 minutes. The battery grip is dust and splash-proof and can be operated at temperatures as low as -10 ° Celsius. ready for use. The controls include the shutter button, the focus lever, the AE-L Button, the AF-ON button, the control wheel, the Q button and the Fn button. Leave it the camera can be used very comfortably even in portrait position. The VPB-XH1 has a headphone jack that allows the sound to be heard during playback Video recording can be monitored. There is also a connection for the Supplied power supply (AC-9VS), with which the two batteries in the handle within recharge for about 2 hours. Portrait pictures can be adjusted. An antistatic coating prevents the adhesion of dust and dirt.